When you think about how to be successful with Sublimation, you probably guess it would be the ink or the printers that matter the most. Most people, if they consider sublimation paper at all, probably think that one paper is pretty much like another, and that the paper you use won’t have much effect on your final product. Everyone sells sublimation paper if they sell any of the ink, blanks, printers, or other items, but all sublimation papers are not created equal. In order to find the paper that is right for you, you need to know how it works, and what sublimation paper really is. Most importantly, you need to know how good the paper you’re buying is. This post is being written to give you the benefit of my experience in choosing sublimation paper. I’ve used many different sublimation papers over the years, from name brands to generics; expensive European products to cheap Chinese options, and a lot of American made papers as well. . In this post, I will also explain just what sublimation paper is, and exactly how it works. Naturally, I want you to choose my MPRES-II paper from EnMart, but convincing you to do that is not the goal of this post. Ultimately I want to help you find the ideal paper for your use, since that’s what it is all about. Sublimation paper can be divided into 3 very generalized categories. Some vendors may disagree with me or may have different categories of their own. . My personal experience however has shown these categories to be accurate. 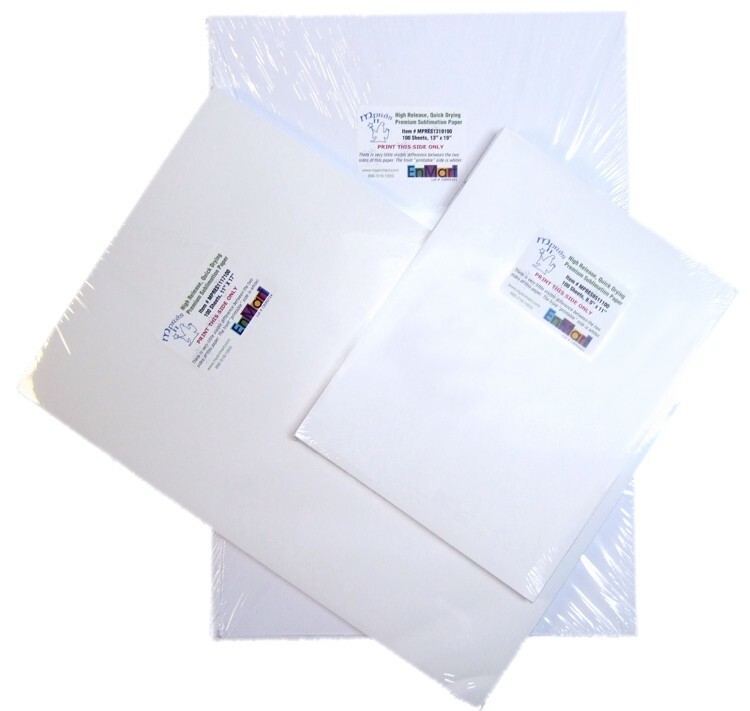 All sublimation paper starts out with a base sheet stock, which varies by manufacturer, brand, etc. This is important to give the paper its weight, some resistance to curling and humidity, and several other properties. The base sheet stock is then coated with a variety of chemicals and compounds which vary by manufacturer. The coating is what actually does most of the “magic” that allows sublimation to occur. If you’ve ever experimented with sublimation using plain copy paper, you were probably very disappointed with the results. That’s because there was no coating on the copy paper. The coating is what actually holds the majority of the sublimation dye in place above the surface of the base sheet, preventing it from being absorbed into the paper fibers, subsequently allowing it to be easily released into the substrate when heated in your press. Since copy paper has no coating, the dye gets absorbed into the paper fibers, and is very difficult to get out again. In Part 2, I’ll go into the different types of sublimation paper in more detail.